Sweet potatoes, pecans, and shredded chicken! That’s all you need to toss together a quick or anytime meal that makes everybody happy. 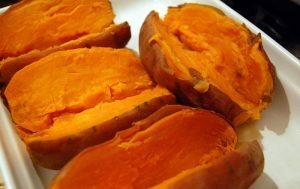 Just bake the sweet potatoes in the oven or microwave. When they’re done, cut them in half, scoop out the cooked sweet potato into a bowl, add shredded store-bought rotisserie chicken and chopped toasted pecans. Stir it up, refill the sweet potato shells with the mixture and pop them in the oven to reheat and crisp up. They’re delicious, good for you and gluten-free.